Babyology Exclusive – Kast van een Huis closets now available in Australia! 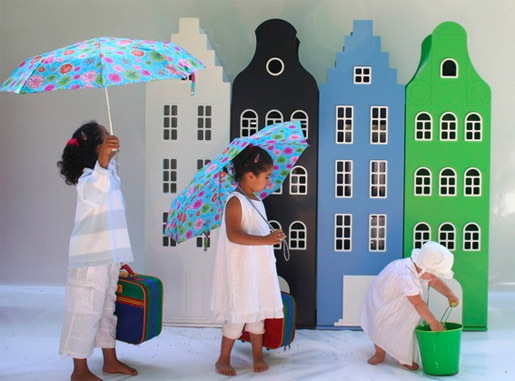 The arrival of these designer Dutch closets in Australia makes it much easier to paint the town red, green, white or even blue! It was love at first sight for me when I mentioned Kast van een Huis last year and I’m thrilled to tell readers they can now buy these gorgeous Dutch-style canal house closets right here in Australia. I can’t wait to hear what others think when they see them at Kids Instyle this month! At $2099 a house, they’re out of my budget so the dream of owning one remains exactly that. However, if you have the cash to splash then you’d be hard pressed to find a more striking storage option – what little person wouldn’t love to put their clothes or toys away here! 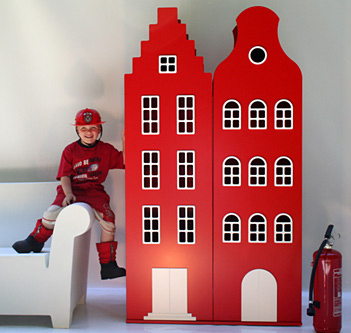 These enchanting buildings stand close to two meters tall, delivering an instant wow factor. Canal house cabinets come in three gable styles and several colour options . Would you mix and match or do you prefer some symmetry? Single Kast van een Huis houses are available for $2099 and there’s a five per cent discount if you buy a street (three houses). Head to Tulpkids for your local stockist details. Tulp Kids also expect to be offering a smaller size too which will retail for about $1900 with availability around May/June.